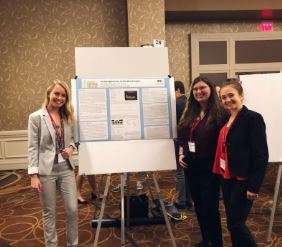 Three Honors College students recently represented Purdue University at the 2018 National Collegiate Honors Council conference in Boston. Nicole Adkins (biochem/class of 2020) and Amanda Gozner (anthropology/class of 2020) presented research from an archaeogenomics study conducted in the UK. Sydney, while Keenan traveled to the conference as a member of the NCHC student board. NCHC organized the conference around the theme Learning to Transgress. It encouraged attendees to consider if they were living up to the possibilities an Honors College education affords. Are they crossing boundaries by cultivating true dialogue? Are they interrogating the privileged positions from which they speak? Are they taking risks in their pedagogical practices? The conference featured workshops, a “Story Slam”, professional development opportunities and presentations by faculty and students, such as Purdue’s group. In spring of 2018, Adkins, Gozner and Honors College student Hallie Write worked under the direction of Honors College Professor Liz Brite to apply methods of genetics research to learn about ancient remains from archaeological sites. They worked in a University of Warwick lab extracting DNA from ancient cotton seeds found in Peru and Uzbekistan. Keenan urges other Honors College students to consider submitting their work to NCHC. Not only will you make friendships and connections with honors students from across the country she says, but you will also walk away with newfound inspiration, perhaps for your Scholarly Project. The research projects other honors students are tackling truly impressed Keenan.